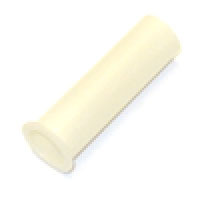 Plastic coil sleeve, 1-3/4 inches (45mm) overall length. Standard size for most coils (solenoids) and mechanisms including many flippers (short coil), pop bumpers, slingshot kickers, saucers, eject holes, outhole kickers, ball trough release kickers, many auto-launchers, etc. Fits all makes/models. Standard 1-3/4 inch size coil sleeve fits most standard size coils including those used in most electro-mechanical (EM) and early solid-state (SS) games. Direct replacement for Capcom # PL00132-01, Data East # 260-0004-00, Gottlieb # A-5064, Williams # 03-7066, Stern # 545-5031-00 and 545-5411-00, old Stern # 4A-152, and more.